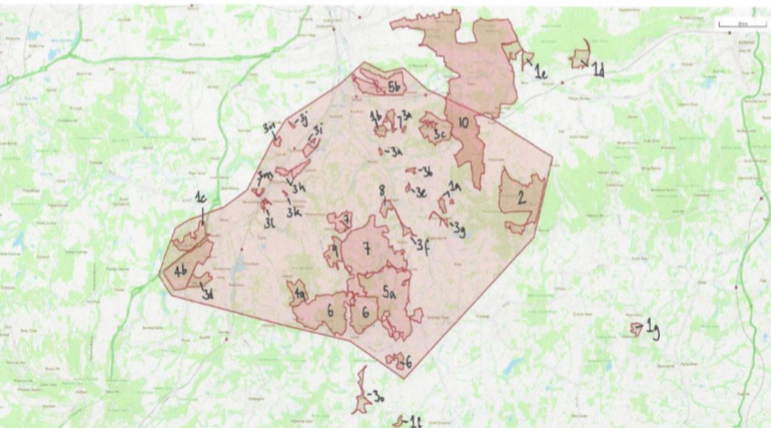 Priority habitats – Maintenance, restoration and creation of ancient and native woodland, wood pasture and parkland with veteran trees and arable field margins where providing connectivity. SSSI – 334ha of SSSI located in project area. Priority species – Butterfly species including pearl-bordered fritillary, small pearl-bordered fritillary, brown hairstreak and wood white. Bechstein bat and hazel dormouse, key mammal species. Woodland bird assemblage – Identify and target a number of specific priority bird species – undertaking site surveys will update and/or fill in gaps in survey data for the area. Water – Western side of area EA flood risk management priority. Significant areas of high and lower priority for CS water – flood risk and key areas for FC planting for flood reduction. Woodland management – Synergies with biodiversity and water priority actions. The area includes the full range of priority woodlands, aim to bring woodlands back into sustainable management. Woodland planting – Group will assess opportunities for new planting for biodiversity, to create wildlife corridors and for water quality and flood risk where appropriate. Landscape – Features surrounding woodland areas including hedgerows, hedgerow trees, in-field trees, bankside trees and permanent grassland will be integrated into the project as a priority. Historic environment – Limited knowledge of historic environment features among members – assessments of sites will be undertaken to identify and plan for features that may exist in the area. Climate change – Habitat maintenance, restoration and creation plans and activities shaped by the need to create future landscapes with resilience to climate change and to protect vulnerable features and species.